The arctic tundra of northern Alaska is called “the sacred place where life begins” by the native Gwich’in people. (McLeod) This unique ecosystem is home to various animal species including wolves, muskox, bears, and caribou. The Gwich’in tribe has been living in coexistence with this land and its creatures for centuries. In 1960 American policymakers recognized the ecological distinctiveness of this land and it was named the Arctic National Wildlife Refuge (ANWR). When the refuge was developed, the indigenous peoples already living there were allowed to continue living on their ancestral lands. The Gwich’in consider the caribou to be sacred. It is believed that “every caribou has a bit of a human heart in him; and every human has a bit of a caribou heart.” (The Gwich’in) This exemplifies the deep spiritual connection between the Gwich’in and the caribou. Songs, stories and dances all incorporate the sacred caribou. It is evident that a threat to the caribou would be a threat to the cultural and spiritual integrity of the Gwich’in population. The discovery of oil in northern Alaska has posed a threat to the indigenous populations of the arctic and the ecosystems in which they live. In 1968, oil was found in the vicinity of the ANWR and the Gwich’in were offered a share of the profits in exchange for the use of their land for oil exploration. (McLeod) The Gwich’in refused on the grounds of protecting their sacred land and preserving their traditional culture that depends on those lands. The ANWR serves a central role in the survival of the caribou heard because it is their birthing ground. 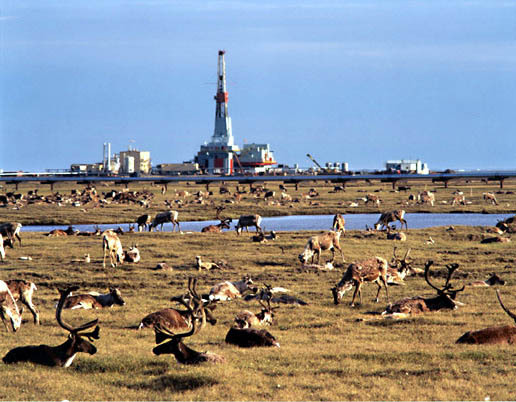 If oil drilling were to occur in the ANWR the birthrate of caribou is estimated to decrease by 40%. (McLeod) The survival of the caribou and the survival of the Gwich’in are closely intertwined. One tribal activist argues that the environmental degradation caused by oil drilling would be like a “cultural genocide” for the Gwich’in people. (Patterson, 18) As the issue of oil extraction gains urgency in the United States, more pressure is put on the oil-rich lands of the Gwich’in people. The traditional culture of the Gwich’in people had already begun to disintegrate at the hands of western influence before the question of oil drilling in the refuge was brought up. One of the main Gwich’in villages is described as having electricity, computers, a fondness for country music, and an overwhelming tendency towards the Episcopalian religion. The local chief likes to combine Gwich’in tribal values and creation stories with the teachings of the bible. (Knickerbocker, 1) It is evident that the old ways have been combined, and often overshadowed by newer traditions in some of the Gwich’in villages. In light of the already weakened cultural integrity of the Gwich’in, the survival of the caribou is the last remaining hope for the continuation of ancient tradition. Gwich’in religious tradition is based on an intimate relationship with nature. Hunting for caribou is not merely a necessary chore, but is instead a ritual of sorts. (LaDuke, 17) Gwich’in hunters often dream about the location of an animal, and upon awakening go to that location and find the animal waiting there. (Gwich’in People) After killing a caribou, a ceremony is performed to give thanks to the animal spirit that was sacrificed. (Findlay) The Gwich’in do not believe in a singular god, but instead honor the sacred spirit within everything in the natural world. There is a belief that all that dies will be recreated in the afterlife. (Zieber) It is evident that if everyday activities such as hunting caribou were altered by environmental changes, the spiritual aspect that is so closely related to these actions would be changed as well. Those who promote oil drilling in the arctic value monetary gain over the cultural and spiritual integrity of the native peoples. It is indisputable that drilling would generate beneficial income for many groups of people. Perhaps the most surprising supporters of oil drilling are the Inupiat Eskimos, the tribal neighbors of the Gwich’in. Both the Inupiat and the Gwich’in struggle with poverty but the Inupiat seek help from oil income, where as the Gwich’in seek assistance from their spiritual connection to the land. This discrepancy shows how westernized some tribal people have become and reinforces the importance of supporting the Gwich’in who still value their spiritual connection to the land. There are non-natives who support the preservation of the ANWR for environmental reasons as well as those who seek economic development from oil extraction. There are few non-natives who understand the concept of sacred land. In the western way of thinking land can have value for its resources, recreational opportunities, or beauty, but land is rarely considered to have a sacred spirit. It is this clash of ideologies that causes difficulties for the Gwich’in in justifying their dependence on land for cultural and spiritual health. 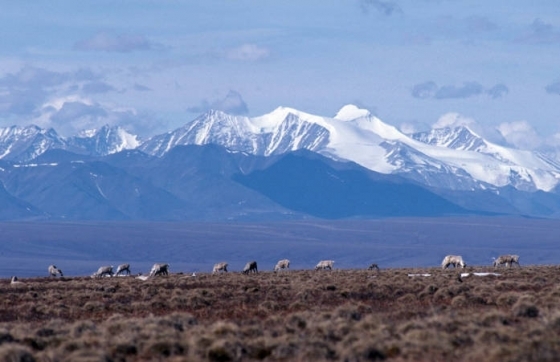 There have been both positive and negative outcomes to the threat of oil drilling in the ANWR. The threat has motivated the Gwich’in people to join together for a common cause. Their organizations have forced policy makers to listen to the indigenous perspectives that are so often ignored. This unity has strengthened the tribe and brought about a reinforced sense of indigenous identity and pride. More non-natives have become invested in the protection of sacred lands because of Gwich’in activism. Oil drilling in “the sacred place where life begins” would clearly be devastating for the Gwich’in people. The traditional lifestyle that they have struggled to maintain could be lost forever. Land is central to spirituality, and spirituality is central to culture. Without culture there is no Gwich’in. If their sacred homeland is lost, so are they. Arctic Refuge. N.d. Photograph. The White House Blog. USA.gov. Web. 16 Nov. 2012. <http://www.whitehouse.gov/blog/2010/12/06/arctic-national-wildlife-refuge-turns-50>.Dunkel, Tom. “Counting Caribou.” Mother Jones 26.3 (2001): 21. Academic Search Complete. Web. 1 Nov. 2012. <http://0- web.ebscohost.com.tiger.coloradocollege.edu/ehost/detail?vid=4&hid=105& sid=40324355-1d>. Caribou. N.d. Photograph. National Geographic. National Geographic Society. Web. 16 Nov. 2012. 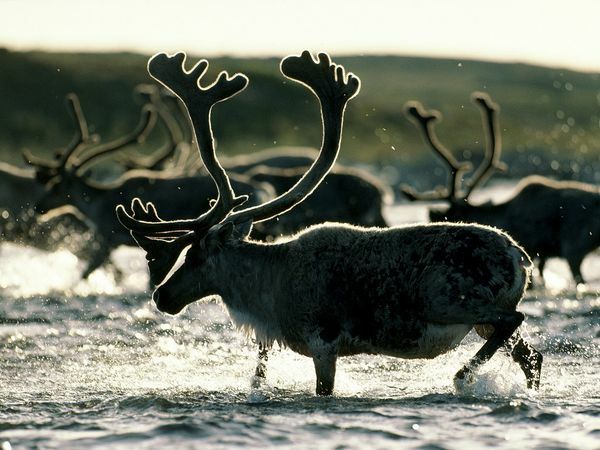 <http://animals.nationalgeographic.com/animals/mammals/caribou/>. Findlay, Heather. “The Subarctic People – Religion / Ceremonies.” The Subarctic People – Religion / Ceremonies / Art / Clothing. C. Goldi Productions, 2007. Web. 03 Nov. 2012. <http://firstpeoplesofcanada.com/fp_groups/fp_subarctic5.html>. “Gwich’in People.” Wikipedia. Wikimedia Foundation, 24 Oct. 2012. Web. 03 Nov. 2012. <http://en.wikipedia.org/wiki/Gwich’in_people>. “Gwich’in Steering Committee.” Facebook. N.p., n.d. Web. 02 Nov. 2012. <http://www.facebook.com/ourarcticrefuge/info>. LaDuke, Winona. “The Porcupine Caribou Herd, the Gwich’in, and Big Oil.” Earth Island Journal 5.2 (1990): 17. Academic Search Complete. Web. 1 Nov. 2012. <http:/0- web.ebscohost.com.tiger.coloradocollege.edu/ehost/detail?vid=3&hid=105& sid=40324355-1d04-443c-adf5- b3191b5a46e6%40sessionmgr113&bdata=JnNpdGU9ZWhvc3QtbGl2ZQ%3d %3d#db=a9h&AN=9611125342>. McLeod, Christopher. “Sacred Land Film Project.” Sacred Land Film Project. Earth Island Institute, 1999. Web. 02 Nov. 2012. <http://www.sacredland.org/>. N.d. Photograph. Opponents to Oil Drilling in the Arctic Wildlife Refuge. UNC.edu. Web. 16 Nov. 2012. <http://www.unc.edu/~money/geography/anwr2.html>. Patterson, Scott. “The Last Hunters.” Academic Search Complete. EBSCO, Oct. 1996. Web. 1 Nov. 2012. <http://0- web.ebscohost.com.tiger.coloradocollege.edu/ehost/resultsadvanced?sid=40 324355-1d04-443c-adf5- b3191b5a46e6%40sessionmgr113&vid=2&hid=105&bquery=(Arctic+Wildli fe+Refuge)+AND+(Gwich%27in)&bdata=JmRiPWE5aCZ0eXBlPTEmc2l0ZT1l aG9zdC1saXZl>. “The Gwich’in of Alaska and Canada.” Arctic National Wildlife Refuge. N.p., n.d. Web. 02 Nov. 2012. <http://arcticcircle.uconn.edu/ANWR/anwrgwichin.html>. Zieber, Maureen. “Gwich’in Culture: Storytelling and Spiritual Beliefs.” Suite101.com. N.p., 28 Dec. 2011. Web. 03 Nov. 2012. <http://suite101.com/article/gwichin-culture-storytelling-and-spiritual- beliefs-a362641>. I am writing to request permission to use the attached illustration OR one of the pictures at- https://sites.coloradocollege.edu/indigenoustraditions/sacred-lands/arctic-national-wildlife-refuge/. • Dr. Christine Ehlig-Economides is Professor in the Harold Vance Department of Petroleum Engineering at Texas A&M University and holds the A.B. Stevens endowed chair. She is a member of the U.S. National Academy of Engineering. • Dr. Sukesh Aghara is Associate Professor in Nuclear Engineering program within Chemical Engineering at the University of Massachusetts Lowell. The Chemical Engineering department offers graduate degrees (EnD, MSE, Ph.D.) in Energy Engineering at UML. • Dr. Anthony Kovscek is a Professor and Chairman of Energy Resources Engineering at Stanford University. • Dr. Sarma Pisupati is Professor of Energy and Mineral Engineering at the Pennsylvania State University where he is Energy Engineering Program Officer and Faculty Associate of the EMS Energy Institute. With your permission we will attribute credit (your input is welcome) in our eBook and on our website at http://live-energy-project.com . If you agree, reply via email with any specific attribution information. Additionally, please provide the link to the highest resolution copy of the image that we may use.